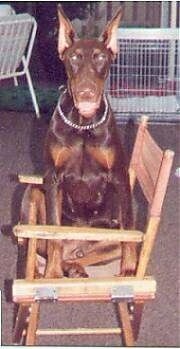 Max the Doberman from Norway at 5 years, 28 inches and 92 pounds. 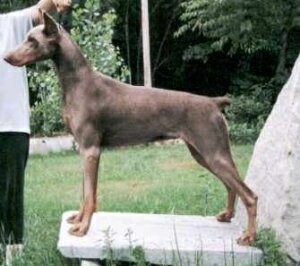 Max is an example of a Doberman with a natural undocked tail and uncropped ears. 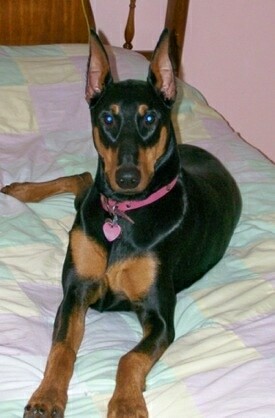 This is Destiny the female black and tan Doberman Pinscher at 2 years old. 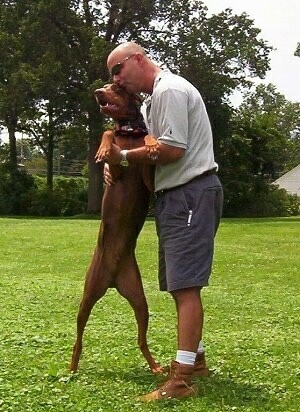 Her owner says, "She is small for a Doberman—21 inches (54 cm) and 50 pounds (23 kg), but she has a huge heart. Very loyal and loving...leery of strangers and noises, but not aggressive at all. She is my most devoted companion, always by my side." 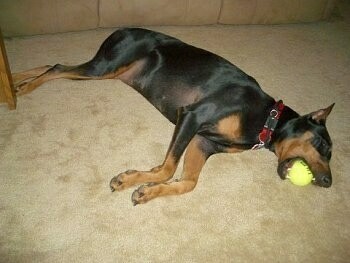 Destiny has an obsession with the tennis ball and often falls asleep with it still in her mouth. 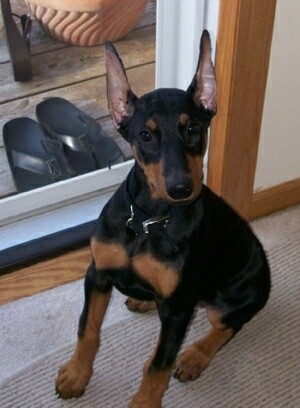 "This is Nina, my Dobe puppy at 12 weeks old. She had just gotten the taping from her ear cropping taken off and we were so excited by the results! Even at 12 weeks, she was already a wonderful dog. Very loving, loves to cuddle. She still needed some help getting onto the couch, though! She loved to play fetch and you would have to make her stop and rest and get a drink. I've watched the Dog Whisperer and his tip of giving ice cubes is fantastic. When we were not able to get her to drink her water we gave her a handful of cubes and she would go crazy. The ice cubes were a help when she started teething! Nina can be full of energy; running, jumping, playing and then lie down and just be petted." 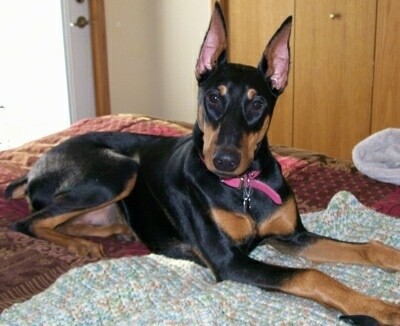 "This is our 7-month-old Doberman puppy Nina. 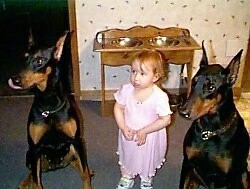 We had never had a large dog before Nina, and I was leery about the breed based on stereotypes!! I couldn't have been more wrong. Nina is a sweet, gentle cuddle bug. She loves our children ages 11, 7 and 5 so much. She gets so excited when they come home from school she jumps, well more like leaps, into the air from sitting position." "I took this picture one afternoon I noticed she had disappeared from sight. I thought she might have been up to no good but, she pleasantly surprised me sunning herself on my bed. Nina is a phenomenal canine. I am so glad I looked at your site to get the truth about the breed. Nina is the best dog we could have ever hoped for." "This is Nina at 12 months showing her fully grown, or at least fully grown into her beautiful ears. Nina is a joy every day! We love her so much. Nina proves still to be the best dog around!" Ike as a puppy at 6 weeks old—"Nina has accepted Ike very well, the mature personality compliments Ike's crazy puppy personality. 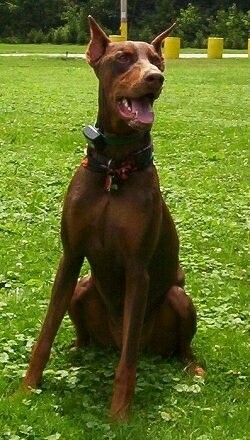 Ike was 1 of 13 puppies in his litter (mama lost 1). His mom is fawn and dad is black. We hope to breed Ike in a few years. 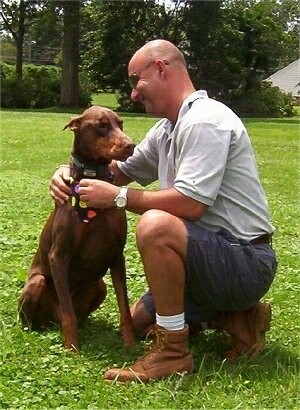 Doberman's are still our favorite breed. Amazing temperament, aims to please and so, so smart!" "This is Ms. Moet. 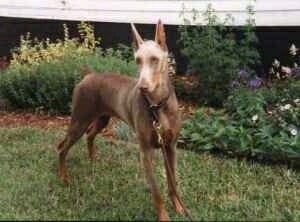 She is an example of the fawn variety of Doberman. What a beautiful dog!"